If you love stitching, you know how essential pincushions are. Without a pincushion, you end up forgetting where you placed your needle and, often, end up finding it by sticking yourself. If you’re looking for new pincushions to add to your collection or a do-it-yourself gift for a friend, why not go with something cute that will spark joy? Make these lovely pie pincushions and bring some fun to your sewing! These pincushions are great for any time of year, and you can make them extra special by personalizing them with different types of pie! Fiberfill or other “stuffing” material. Hot glue or another type of craft-friendly glue. You’ll also need a marking pen, some scissors, and flexible measuring tape. Finally, you’ll need small amounts of felt fabric in various colors, depending on what kind of pies you want your pincushions to be. 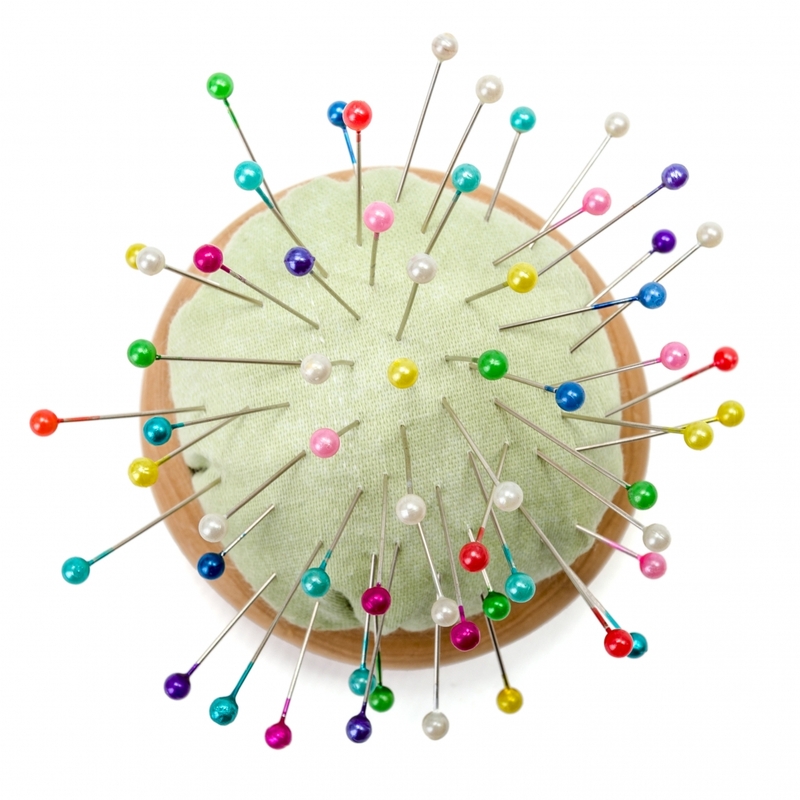 No matter what kind of pie you’re making your pincushions into, they all need a crust, so creating it will be your first step for each pincushion. You’re going to be using the mason jar lids as templates for your pincushions. Use this round to trace a circle on the felt and cut it out. With a flexible measuring tape or a piece of string, measure the outer edge of your mason jar lid, since they come in lots of sizes. Cut a rectangle out of your crust felt. This rectangle will be the same length as your mason jar lid and one inch wide. Cut a freehand edge along one of the long sides of this rectangle that’s a bit wavy, so it looks like an outer crust would. Put the two short sides of the rectangle face to face and sew them together, so they make a circle. Align the straight edge of this loop with the bottom circle you cut out and sew these together. Now your crust is ready to fill! If you want to make a pumpkin pie, your next step is going to be to use the edge of the mason jar lid to trace a circle onto some orange felt; once you’ve outlined the ring, cut it out. Use your quarter as a template to trace and cut out about 18 white circles. Using a model, cut little wedges out of the ring so that it looks like a windmill. Use your needle and thread to bring the upper points of all the wedges on a white circle together; pull the thread tight and bring it through the center to the back side and tie a knot to secure your dollop. Repeat this action with all the dollops. Sew your orange circle just below the freehand, curved edge of your crust. Attach about 3/4 of the orange circle and then insert the fiberfill. Finish attaching the pumpkin pie. Put dollops of whipped cream around the cake and use the glue to connect them. Glue the bottom of your pie to the mason jar lid, and your pumpkin pie is ready to go! Make your bottom crust for your cherry pie as directed above. Use the lid to trace a circle on red felt and cut the circle out. Cut six strips of felt the same color as your pie crust 1/4″ wide. Cut zig-zags into the edges of the strips. Lay them across the red felt in a criss-cross pattern. Either sew or glue these pieces into place. Trim any crust that hangs off the edge of the red felt. Sew the red circle onto your outer crust, right below the wavy upper crust area. Sew the ring on 3/4 of the way, then stuff your pincushion with fiberfill. Finish attaching the two pieces of the pincushion. Glue your mason jar lid to your pincushion. Make your outer pie crust. Use your lid to trace a circle onto blue felt; then cut it out. With the mason jar, outline a circle on the felt you’ve been using for your pie crust and cut the circle out. Use your nickel as a template to cut out three smaller circles from the blue felt. Draw several tear-drop shapes into your top crust circle, and then cut them out. Sew or glue together the blue felt, and the top crust felt. You should be able to see blue through the teardrop shapes you’ve cut in the top coat. Run a needle and thread around the outer edge of one of the smaller blue circles. Cinch the thread to pull the circle into a round ball and tie your thread into a knot. Repeat this with the two other small blue circles of felt. Sew the top of your pie right below the edge of the bottom crust. Sew this layer on about 3/4 of the way, then stuff your pincushion with the fiberfill. Finish sewing your top onto the crust bottom. Finally, use glue to secure your pincushion onto the mason jar bottom. Once you’ve figured out the basics behind making pie pincushions, why not get creative with patterns of your own? Build your favorite pie, or create pincushions based on your favorite non-pie dessert! The possibilities are endless. And the best part? You have a go-to easy craft to make for holidays and gifts! At The Inspired Sewist, a team of crafts-loving people from all walks of life awaits. Showcasing the top sewing machines in the business and the friendliest staff in the area, we can’t wait to hear all about your craft projects. Contact us to find out more about our store!